On-Track has the equipment and people to handle small tie change out programs. On-Track’s CROR qualified operators utilize rubber tired excavators and backhoes equipped with hi-rails to access any location. Our machines are equipped with a tie change out attachment that has been custom designed and built specifically for changing track ties and switch ties. Hi-railed rubber tired excavator or hoe. On-Track has successfully operated the material handling consists on CN’s main line for many years. On-Track has worked with a team of engineers to formulate a modified load chart for our excavators lifting from flatcars. The Modified Load Chart includes variances for working on curves. Railcar mover, flatcars and a crawler excavator equipped with railway approved grapple, magnet and jib boom to allow for a 37 foot reach. 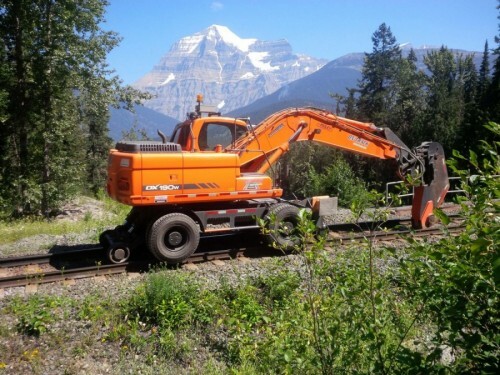 CROR qualified operators who are experienced working with all types of track protection including, but not limited to: T.O.P., O.C.S clearance, Rule 42 and Rule 105. Operators who have many years experience handling all types of new and used track material. Rail, ties, OTM, track panels, bungalows and anything else railroad related that needs to be moved. On-Track operators that are keen to the sensitive nature of new materials and are able to handle new material without damage. For years On-Track has been utilizing tie panel clamps designed and manufactured in house. Our skilled operators are able to transload 7 wood or concrete ties in panel configuration at the rate of 4 panels per minute. On-Track’s telescoping tie spreader has the ability to clamp onto 7 ties and telescope the ties to proper spacing for placement onto grade. Our tie spacer can also be used for loading and unloading panels. Both panel clamp and spreader clamp were proven extremely successful handling, distributing and spacing ties to grade at both Edmonton and Calgary Light Rail Transit expansion projects. Handle both wood and concrete ties. Lift 7, 12 and 24 ties per panel configuration. Telescope the panel of 7 ties to proper track spacing. On-Track’s Rail Breaker is a rubber tired excavator equipped with hi-rail gear and rail breaker attachment. Our CROR qualified operators are able to travel the breaker to any location by rail to process your scrap rail. Whether you need 39 foot cuts or 3 foot cuts, our breaker can accommodate. CROR qualified operator, no need for 3 man cutting crews. Rubber tired excavator equipped with hi-rail gear and rail breaker attachment. 50-70 cuts per one hour of track time. Travel at track unit speed. No need to transport flammable gas cylinders. No open flame or slag causing dangerous grass and structure fires. On-Track has over 20 years experience handling every type of track material into and out of every type of stockpile, railcar or truck. Whether it be a high walled gondola cars, spline cars or pulpwood cars we’ve either loaded or unloaded it. Whether it be rail, ties, OTM or a bulldozed pile of scrap, we can load it or unload it. We have CROR experienced operators who utilize dangle head grapples, magnets, tongs and/or whatever we can customize to handle the job. They will safely and quickly get your materials transferred. The right machine and attachment for the job.